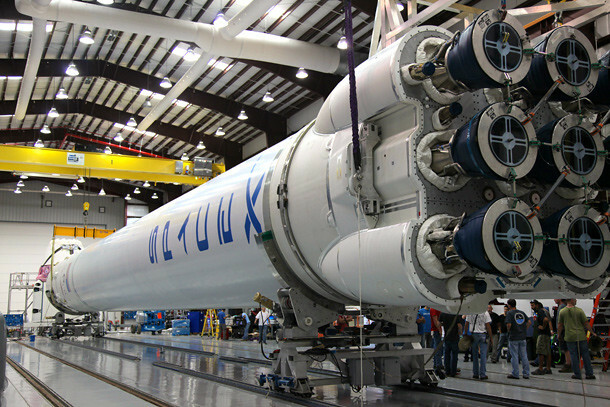 Tonight, Sunday, October 7, at 20:35 Eastern (US) time (or 00:35 UTC on the morning of October 8) the private company SpaceX is scheduled to launch a Falcon 9 rocket to the International Space Station (PDF). Sitting on the top of the rocket is a Dragon capsule loaded with half a ton of supplies for the astronauts on the ISS. This is very exciting! They have accomplished this amazing feat once before, back in May, as part of a demonstration flight. Because of that, NASA gave them a contract for twelve more flights, and this is the first one of those dozen – it’s designated Commercial Resupply Services-1 or just CRS-1. That’s this mission’s Falcon 9 rocket there, lying on its side. As you can see, it’s quite a beast. As with all rockets, most of the main body you see there is for carrying fuel, and the payload, the Dragon, is at the very top. Once launched, the Dragon will detach, and is scheduled to rendezvous with ISS on Wednesday, October 10. It’ll dock with the station and remain berthed there for two weeks. It’s carrying supplies, including equipment, hardware, and even clothes for the astronauts on board. Once all that is offloaded, the astronauts will load it back up with 350 kilos of material to bring back to Earth, including results from experiments and now-unneeded hardware. I have my suspicions there might be a stowaway on board though. Anyone seen Bernadette lately? Anyway, on October 28, the Dragon is scheduled to undock, do a de-orbit burn, and splash down in the Pacific off the coast of southern California. A complete overview of the mission is available as a press kit (PDF; same link as above). It’s pretty good reading, so if you plan to watch you should give it a once-over. 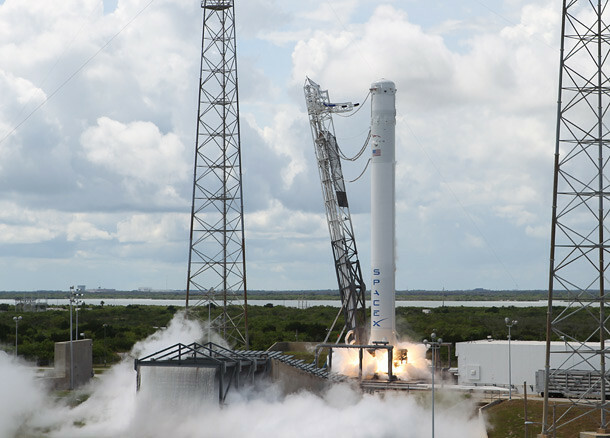 If you do want to watch, there will be a live video stream both from SpaceX and NASA. This mission is really important. Well, they all are, of course, but it’s critical that SpaceX can show not only that they can do this, but that they can do it again. When I was in high school band, we’d rehearse the music, and if we played it perfectly the band instructor would say, "Let’s do it again to make sure that wasn’t by accident." The earlier Dragon mission was almost completely flawless, but it’s when you can do it again that you can really show you know your stuff. My best wishes to the team st SpaceX. And I’ll be live-tweeting the event, so follow me on Twitter for that. I’ll update this blog post as I can and if needed, too.